We also support ground breaking research into finding betters ways of preventing and treating back pain. To continue to provide this vital help, we rely on the generosity of people like you, raising money in the most imaginative of ways. Many of our fundraisers use the trusted platform, Virgin Money Giving to help manage donations and publicise their event. Not for the faint-hearted! Get more or less hairy through shaving your head or growing a moustache, wear your worst fashion faux pas for a week, or go out with your mates in the opposition team’s football kit. How much embarrassment can you take? Making people laugh is a sure way to bring in donations through sponsorship and collections. Fundraising at work is a great chance to bond with your colleagues. Who can resist a homemade snacks sale or the chance to dress down on a Friday? Other tried and tested work fundraising ideas include making your team lunch for a fiver, organising an office sweepstake, taking part in a fancy dress day or auctioning off your space in the car park. Selling homemade treats is a classic fundraiser which is guaranteed to bring in donations. It’s easy to use eBay for charity to sell your unwanted items for a great cause. Or why not ask for donations for old books or CDs at work? Are you the type that likes to get your teeth into a project and the chance to get your glad rags on? Take your pick of classic charity evenings: dinner dance, auction night, music, fashion or dance show. With a bit of time, some hard work and a helpful group of friends to support you can put on a night to remember. 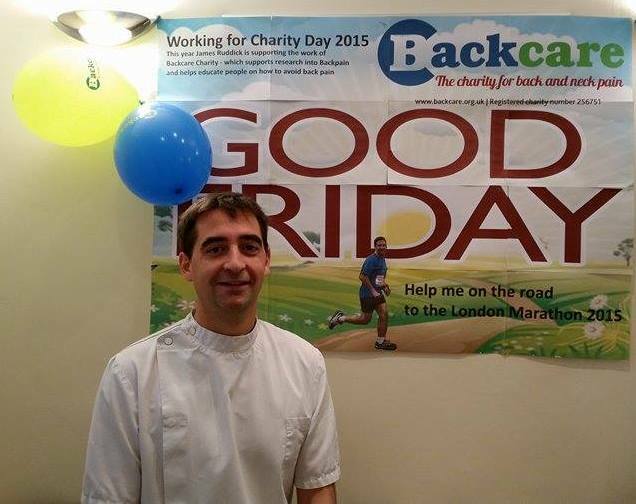 Why not open your clinic on a Bank Holiday or on a weekend and ask you patients to donate the cost of their treatment to BackCare. You don’t need to book the Ritz to put on a great fundraising bash: get your friends round and raise money at home. Coffee mornings, BBQs, cheese and wine nights or themed parties are all easy fundraisers: just ask people to bring a donation along on the day. To make your home fundraiser into more of an event, why not add some extra fun? You could hold an old schools sports day in your garden, a Wii contest in your sitting room or a kids cupcake decorating competition in your kitchen. Or, for budding chefs, why not organise a Come Dine with me dinner group or set up a supper club and open up your lounge as a restaurant?